Monday was an afternoon mooching round Swanage. We arrived from Herston Halt, I always find it strange when I have to put my arm out to stop a train, being hauled by diesel and left with a fine steam loco up front. Swanage like Wareham has changed very little over the last half century. No complete town centre makeovers on the Isle of Purbeck. Yesterday was very hot, perhaps not the best day to be scrambling round Cromwell’s destruction of Corfe Castle but we survived despite the gunfire (the army were practising on the ranges just up the road near Kimmeridge). I drove off heading for the puddles – that’ll be Tolpuddle, Puddletown, Affpuddle and Briantspuddle – but on a whim turned left intending a quick visit to Lulworth Cove until I encountered an oncoming Moho. I’m convinced I was far enough over, the plants were slapping R0X1’s nearside, it wasn’t single carriageway and there was plenty of room but there was a sickening very loud bang … complete destruction of the mirror … again! Having stopped, accosted a random stranger and demanded directions to the nearest motorhome dealer I headed very gingerly to Poole. Quite scary when you need to move into the right hand lane with no idea if anyone’s already in it! Much later than expected I got to Tolpuddle but of course by this time the museum was closed. The sculpture was well worth seeing tho’. These six men have been my heroes for many years; brothers George and James Loveless, James Brine, James Hammett, Thomas Stansfield and his son John. It was George who had established the Friendly Society in Tolpuddle and they refused to work for less than 10 shillings a week, although by this time wages had been reduced to seven shillings and were due to be further reduced to six. All six were arrested for and convicted of swearing a secret oath as members of the Friendly Society of Agricultural Labourers . They were sentenced to transportation and penal servitude in Australia. They were later pardoned following a huge public outcry petition and march. Although not true martyrs in the strict sense of the word the six men who unknowingly began the trade union movement came to be known as the Tolpuddle Martyrs. The sculpture by Thompson Dagnall in 2001 shows six seats only one being occupied, by George Loveless, who is depicted raging his frustration at injustice to the skies. P.S. Replacement mirror on order at Webbs to be done on my return. The Massacre, 10th June 1944. 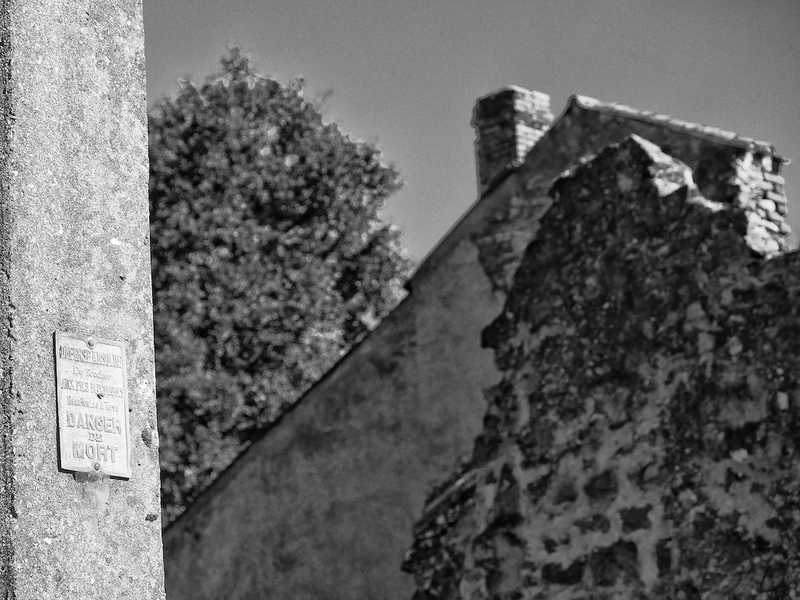 Yesterday I visited Oradour-sur-Glane where on that date the village was completely surrounded by the SS, it’s inhabitants rounded up and 642 men, (but mainly) women and children were brutally killed. First they were machine gunned and then the village and bodies were set on fire, unfortunately at this point not all the victims had yet died. Only 5 men and one woman escaped the massacre. Months later, on visiting the ruins, General Charles de Gaulle announced that the ruins would be left as a memorial to the victims of this and other similar atrocities committed by the Nazis during WW2. Lidice 476, Marzabotto 1836, Distomon 239 and Maille 124. I don’t know why I felt compelled to go, I knew it would not be a pleasant experience. My 3 beloved older brothers, then small boys, would have been of an age with the younger children slaughtered. I’ve seen photos of my brothers in 1944 and they were dressed similarly, the same hair cuts and innocent expressions as the dead children in the class photographs from a year earlier. Perhaps one reason the visit affected me so deeply; another that the victim numbers are easily visually imagined. The ruins are maintained exactly as the SS left them, there is no litter, visitors of all ages talk quietly, walk slowly, thoughtfully and look with respect.